80 MMS December 2016 mmsonline.com FEATURE polycrystalline diamond and even glass. 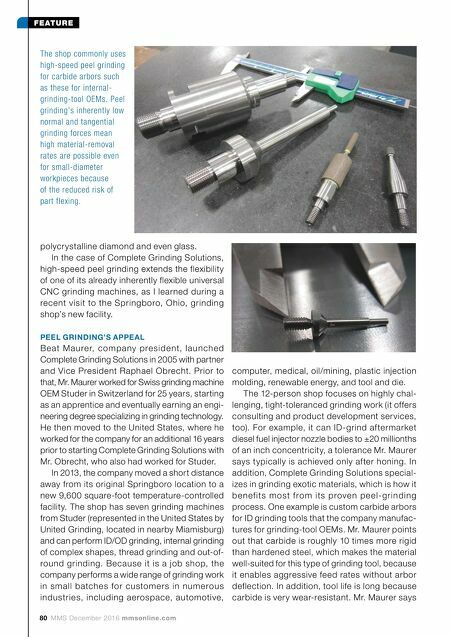 In the case of Complete Grinding Solutions, high-speed peel grinding extends the flexibility of one of its already inherently flexible universal CNC grinding machines, as I learned during a recent visit to the Springboro, Ohio, grinding shop's new facility. PEEL GRINDING'S APPEAL Be at M aure r, compa ny pre side nt, launche d Complete Grinding Solutions in 2005 with partner and Vice President Raphael Obrecht. 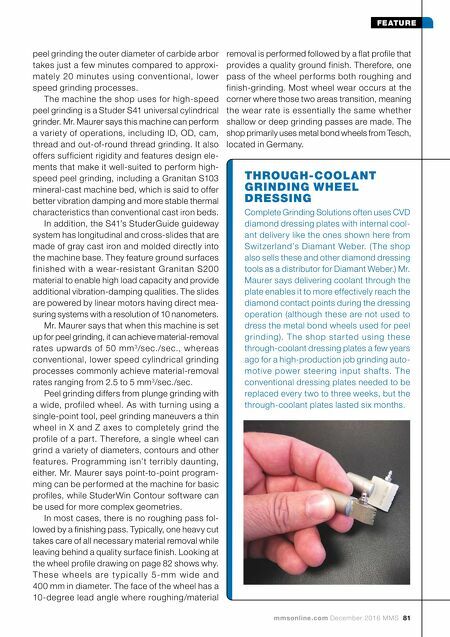 Prior to that, Mr. Maurer worked for Swiss grinding machine OEM Studer in Switzerland for 25 years, starting as an apprentice and eventually earning an engi- neering degree specializing in grinding technology. He then moved to the United States, where he worked for the company for an additional 16 years prior to starting Complete Grinding Solutions with Mr. Obrecht, who also had worked for Studer. In 2013, the company moved a short distance away from its original Springboro location to a new 9,600 square-foot temperature-controlled facility. The shop has seven grinding machines from Studer (represented in the United States by United Grinding, located in nearby Miamisburg) and can perform ID/OD grinding, internal grinding of complex shapes, thread grinding and out-of- round grinding. Because it is a job shop, the company performs a wide range of grinding work in small batches for customers in numerous industries, including aerospace, automotive, computer, medical, oil/mining, plastic injection molding, renewable energy, and tool and die. The 12-person shop focuses on highly chal- lenging, tight-toleranced grinding work (it offers consulting and product development services, too). For example, it can ID-grind af termarket diesel fuel injector nozzle bodies to ±20 millionths of an inch concentricity, a tolerance Mr. Maurer says typically is achieved only after honing. In addition, Complete Grinding Solutions special- izes in grinding exotic materials, which is how it be nef its most f rom its prove n pe e l- gr inding process. One example is custom carbide arbors for ID grinding tools that the company manufac- tures for grinding-tool OEMs. Mr. Maurer points out that carbide is roughly 10 times more rigid than hardened steel, which makes the material well-suited for this type of grinding tool, because it enables aggressive feed rates without arbor deflection. In addition, tool life is long because carbide is very wear-resistant. Mr. Maurer says The shop commonly uses high-speed peel grinding for carbide arbors such as these for internal- grinding-tool OEMs. Peel grinding's inherently low normal and tangential grinding forces mean high material-removal rates are possible even for small-diameter workpieces because of the reduced risk of part flexing.